Since the beginning of the creation of The Americana Stars Memorial, I have wanted to start a Safe Haven Program. Stores, shops, restaurants and any retail location that becomes a part of this program can display the sign below in their front window. 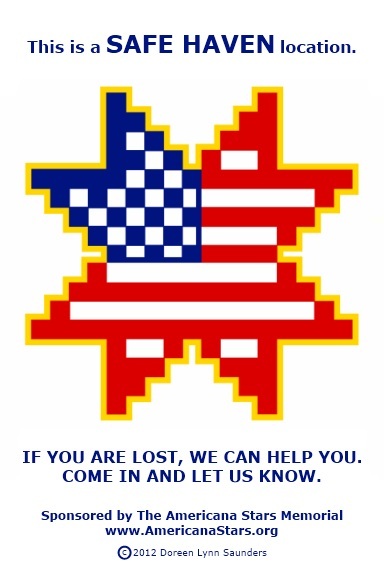 Anyone who is lost and sees this American flag star logo will know that they can walk in and receive help to get home, whether that means calling your local police precinct or a phone number that the person may have with them. Because the emblem design is unique and distinctive, people who do not speak or read English will recognize the location as a "safe haven". It is also a great star for small children who are not yet old enough to read. We live in a world where if a child or older person gets lost, many dangerous things can happen. Children get separated from their parents or lost when coming home from school, leaving them unable to know who to trust to safely get them home. Too many times we have heard news stories about how kids have trusted the wrong person and bad things happen. Older people with dementia or Ahlzeimer's wander off and get lost. My own mother had difficulties created by mini strokes that left her unable to determine where she was and how to get where she needed to be. As this is a brand new program, I still have research to do and many details to work out. Please be aware that this Safe Haven program will be started in my area of Queens, NY first. For locations in my immediate NYC area, I can supply the signs. They will come in 3 sizes, depending upon the size of the location and the window. I will have notices available for distribution to your customers. If you are out of my immediate area or state, I will email the files so you can print them out. If you are a shopowner (or know someone who is) and would like to be part of this program, please click on the email button below. The sooner people recognize the logo, the sooner the program can help. Also, getting the information out to Senior Citizen locations, kindergartens, schools and to the news media will make that happen. This program is a part of The Americana Stars Memorial. If you would like to make a donation to help support this program, please click on the Donation button below - "Click Here to Donate". Fractured Atlas is a national 501(c)3 nonprofit arts service organization that will put your tax-deductible donation into a fund for The Americana Stars Memorial. They will notify me that a donation has been made and I will thank you personally for your kindness with a custom designed Certificate of Donation. It's that easy!